Leica Microsystems’ 4Tune detector, the key component of the SP8 DIVE Deep In Vivo Explorer, provides spectrally tunable image recording with non-descanning detection. An innovative solution for multiparameter multiphoton microscopy. The colorful image on the right shows multiphoton microscopy of an unstained mouse skin section acquired using the 4Tune detector. The green color codes for autofluorescence of muscle tissue. Red shows second harmonic generation of fibers upon illumination with 900 nm. The blue pattern is generated by third harmonic generation at lipid boundaries from illumination at 1230 nm. 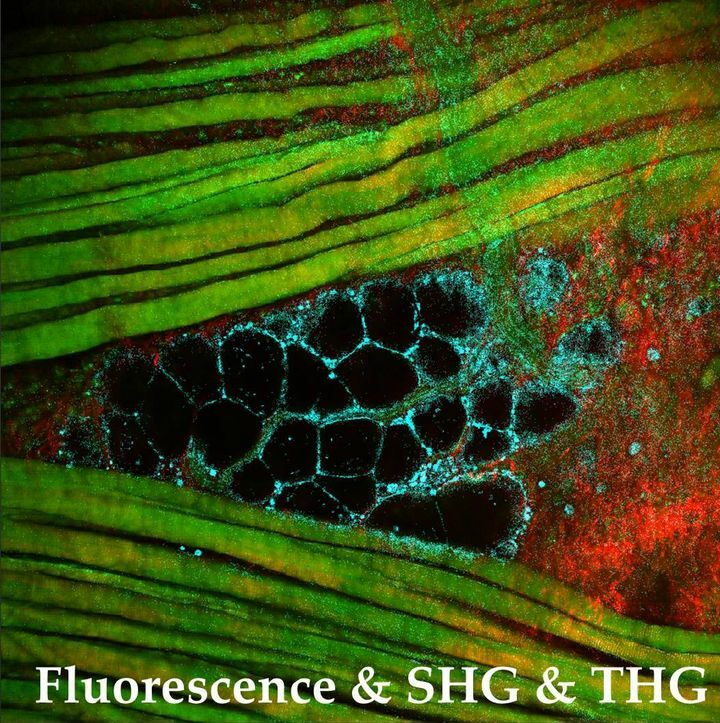 Fluorescence microscopy in the field of biomedical research is usually concerned with the correlation of a series of differently colored emissions. The different colors code for specifically dyed structures or metabolic parameters. Biology is the science that studies living organisms. Living organisms are moving even at the microscopic scale. This fact is not only true for fast moving protozoa, but also for supposedly static individuals like plants. Cell compartments, proteins and metabolic molecules are typically labeled with fluorescent markers of different color. Multiphoton microscopy adds other options, like second and third harmonics generation. These color channels are preferably recorded simultaneously, i.e. in parallel to keep them correlated in the highly dynamic changing neighborhood. This way, simultaneous recording preserves the temporal and spatial interrelationships between the investigated biological parameters and also increases the temporal resolution. It requires a number of light sensors for the different color channels that operate in parallel and which are provided simultaneously with the relevant fractions of the spectrum of light. The alternative was sequential recording, where a single sensor is provided for the different spectral fractions, one after another, and images are recorded of each fraction and subsequently overlaid. With the sequential approach, not only can the spatial and temporal correlation be lost, but also the temporal resolution is lower by a factor that equals at least the number of recorded parameters. Consequently, the total data acquisition takes much more time: by the same factor. The classical solution to separate the spectral emission-fractions for simultaneous recording is an arrangement of dichroic beam splitting mirrors and barrier filters. Such a design has the disadvantage that, for changing dye combinations, the system must provide appropriate filter configurations, making it a costly, slow and inflexible solution. For a single-channel system, this inflexibility was removed by using a spectral device, the spectrometer. The first multi-channel spectrometric device with freely tunable detection channels for confocal microscopes allowing to record images in different colors simultaneously was introduced by Leica Lasertechnik  in 1997: the SP-detector. The SP-detector solution for confocal microscopes employs a prism splitting the detection light into its spectral components and a set of cascaded spectrometer slits passing a tunable band onto a sensor. The motorized barriers are made of reflecting mirrors and, thus, allow the complementary fractions to be further directed onto sensors. In this way, the full spectrum can be cut into a number of fractions and each fraction can be fine-tuned for optimal separation of the channels without computational number crunching. This concept relies on the fact, that the emission beam in a confocal microscope is stationary. The scanning movement is compensated for by the scanning mirrors which are passed by the emitted light in the opposite direction. The stationary beam is then fed through the detection pinhole generating an optical section. In multiphoton microscopy, though, the optical section is created by the non-linear interaction of photons, which have sufficient density only in the focal plane. Hence, no pinhole is needed and the emitted light can be detected before it passes the scanning device, that is, non-descanning detection. This method is especially important for imaging deep inside turbid objects, like many biological samples, because they show significant scattering causing photon losses. With a non-descanned detector, the collection efficiency is much better, the images are crisper and the researcher can look deeper inside the specimen. However, the concept has no stationary beam and that causes the spectrum to wobble over the prism and the spectrometer slit, resulting in a position-dependent spectral response. So far, the separation of various emission channels in non-descanning detectors was accomplished by dichroic mirrors and barrier filters with fixed spectral specifications. When the experimental setup was changed, also the filters needed to be exchanged. There was no way to optimize the performance by continuously changing the filter parameters. One obvious solution is to swap the spectrally fixed elements with gradient elements. Unlike ordinary dichroic splitters and filters, gradient elements feature a spectral change along one of the spatial dimensions. Simple color gradient filters are commonly used in effect-photography, but there are also high-performance dielectric filters and splitters. When a gradient filter is moved about a beam of light, the spectral properties of the emergent beam can be continuously tuned. Therefore, gradient filters are sloppily called “variable filters”. Figure 1 shows this principle for dichroic beam splitting, it applies analogously for short pass or long pass filtering. Figure 1: Performance of a gradient dichroic used as a tunable (variable) dichroic splitter. 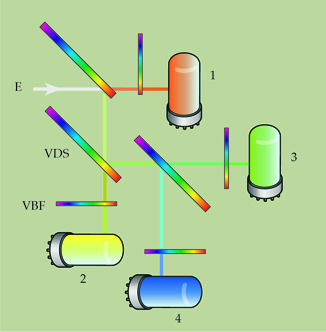 Left: the emission (E) is split into two color bands by the variable dichroic splitter VDS. The switch from reflection (R) to transmission (T) occurs at a long wavelength (λ). 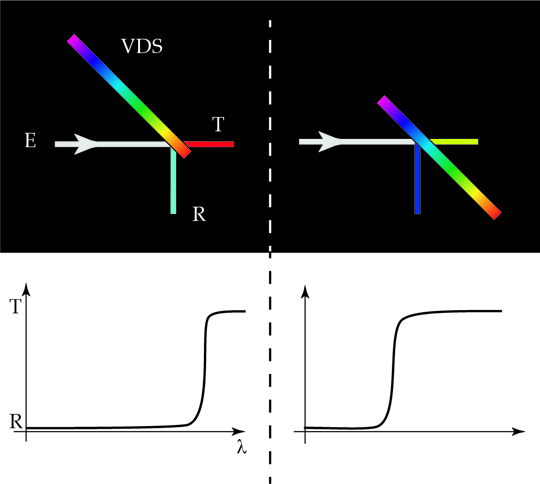 Right: upon shifting the VDS’s position, the switch R to T occurs at a shorter wavelength. All we need to record multiple channels simultaneously is to make a cascade of such gradient dichroics using the transmitted and reflected fractions of the spectrum for further segmentations. For fine tuning the collected emission, we can place a combination of variable short and long pass filters in front of the detector. Figure 2: Fine tuning the emission (E) for example to reduce crosstalk by a variable band-pass filter (VBF). Left: tuned to a red band. Right: tuned to a blue band. The band edges are individually tunable and, thus, the center frequency and bandwidth as well. Although we can build a non-descanning detector with tunable spectral detection channels from gradient filters, the scanning microscope requires an ingenious design for the setup. It is the angle and position changes in a scanning beam and the properties of gradient dielectric optical filters which give rise to the need for such a design. Both will be discussed in the following two sections. A scanning microscope is designed to move a light spot in the focal plane in two directions, x and y. Therefore, the position of the beam is continuously changing in the focal plane (F in Figure 3) or any plane that is conjugated to the field, for example, the intermediate image plane. Figure 3: Beam properties in a scanning microscope are displayed by the main rays (principal rays) a, b and c of each pencil of rays travelling through the microscope. The rays a, b, and c illuminate different positions in the field plane F. They are transformed by optics into different angles, but fixed position in the pupil plane P. In the planes G between F and P, both position and angle are varying. In the pupil plane (refer to P in Figure 3), which coincides with the back focal plane of microscope objectives, the position is fixed, but the angle changes continuously with the scanning process. This relationship is used to conveniently scan the sample, without moving the specimen or light source. The scanning mirrors are positioned in a plane conjugated to the back focal plane. When scanning, the mirrors change the beam angle which translates into a position change in the focal plane. In any plane like G, which is positioned between F and P, both angle and position are changing with the scanning. Filters of different design behave differently, depending on their position and angle (see Figure 4). Pigment Filter: For a traditional color filter, which is usually a slice of glass containing color pigments, the position where the beam passes the filter glass has no effect on the spectral performance. When illuminating such a filter non-perpendicularly, then the distance the light passes through the homogeneous material becomes longer. Consequently, the transmission decreases. Figure 4: The behavior of different design concepts for optical color filters, depending on the illumination position and angle. For more details, see the text. Interference filters are composed of an empty glass substrate coated with layers of dielectric material in a specific sequence, hence, they are also called dielectric filters. These layers cause interference between passing light rays. The combination of layer thickness and material composition enables the filtering action which allows the desired fractions of the spectrum to pass through the filter, while the complementary fractions are reflected. An interference filter which is not operated under perpendicular illumination allows to collect both the transmitted and the reflected fraction. For this case, the filter is known as a dichroic mirror. For homogeneously coated filters and dichroic mirrors, the illumination position has no effect on the transmitted light. A change of the incidence angle, though, causes significant changes in color for a dichroic mirror. Usually they are operated at an incidence angle regime around 45°. For interference filters, operated at perpendicular incidence, the variation is negligible. Gradient interference filters have the same properties as the homogeneous interference filters, but the color response is changing along one of the spatial directions. Therefore, the transmission is dependent on both the angle of incidence and on the position in the graduated direction. This solution seems to be the worst for a scanning microscope, as the spectral properties would change during scanning at any position in the beam. Therefore the question arises: is there a way to use gradient filters for multichannel detection in a non-descanning beam path despite all these color effects? If we place the gradient filter in a plane conjugated to the field, then we will have color changes due to the varying position. In a plane conjugated to the pupil we will have color changes due to the varying angle. But if we put the filter in a good position (position G in Figure 3), and if we design the filter coating appropriately, then we can make the two effects cancel each other out . The calculations for design of beam path and filters are somewhat cumbersome, but lead to a practical solution. These results are achieved with the 4Tune detector by Leica Microsystems. 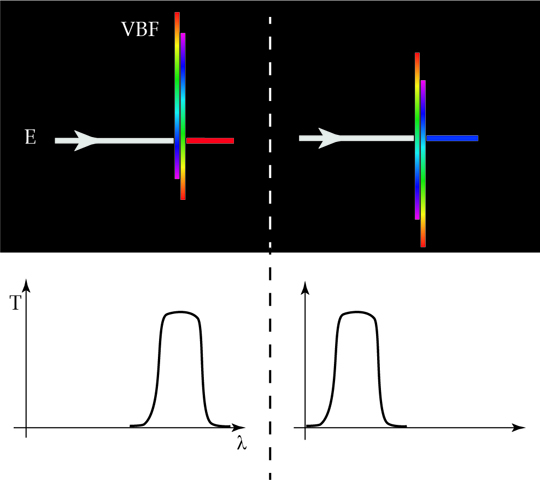 Figure 5: 4Tune spectral non-descanning detection: emission (E) from the sample is spatially separated into sub-spectra by a set of continuously variable dichroic splitters (VDS). The final signal fractions can be fine-tuned by continuously variable band-pass filters (VBF) before being picked up by sensors 1, 2, 3, and 4. The 4Tune detector from Leica Microsystems uses the above described technology. 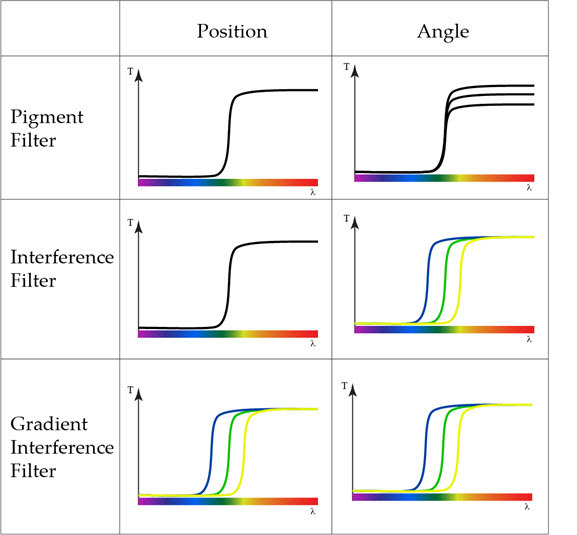 Gradient dichroics and filters are integrated in the SP8 DIVE which offers four freely and independently tunable spectral channels for non-descanning detection in multiphoton microscopy. The user can define the desired bands easily in an intuitive and neatly arranged graphical software interface. The interface allows users to set the spectral bands in fluorescence for the best efficiency and channel separation. It also allows seamlessly tuning the detection for second or third harmonics, whenever changing the illumination wavelength - simultaneous to fluorescence recording. Figure 6: Image of a mouse skin section taken with mulitphoton microscopy using a 4Tune detector. Small intestine of Lgr5CreERT2-GFP confetti mice. 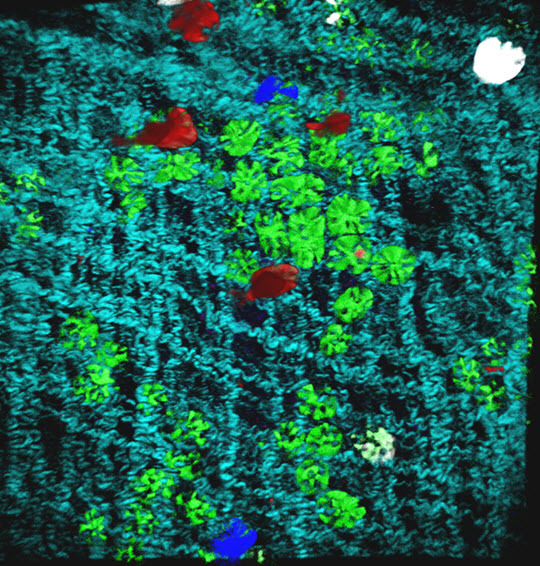 Gray: SHG signal (collagen 1), green: Lgr5+ stem cells. Red, blue and yellow, traced cells that are progeny of the Lgr5 stem cells. Sample courtesy of Jacco van Rheenen, Utrecht (the Netherlands). Engelhardt J: Device for the selection and detection of at least two spectral regions in a beam of light. World Patent WO 1995007447 A1, priority Sep. 8th (1993).